A Galápagos brown pelican takes a break from fishing off the Malecon in Puerto Ayora. With over 12,000 people, Puerto Ayora is the most populous town and has the best developed infrastructure in the archipelago. 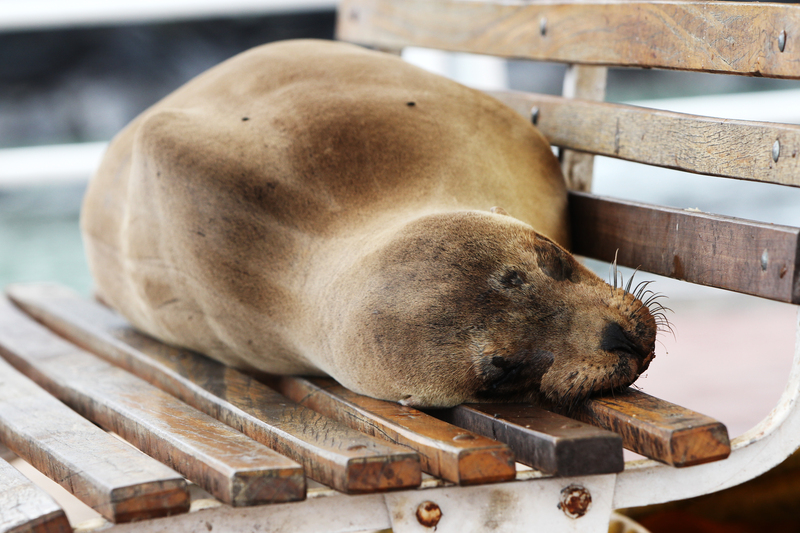 [/media-credit] A Galápagos sea lion sleeps on a park bench at the Malecon of Puerto Ayora on the island of Santa Cruz. 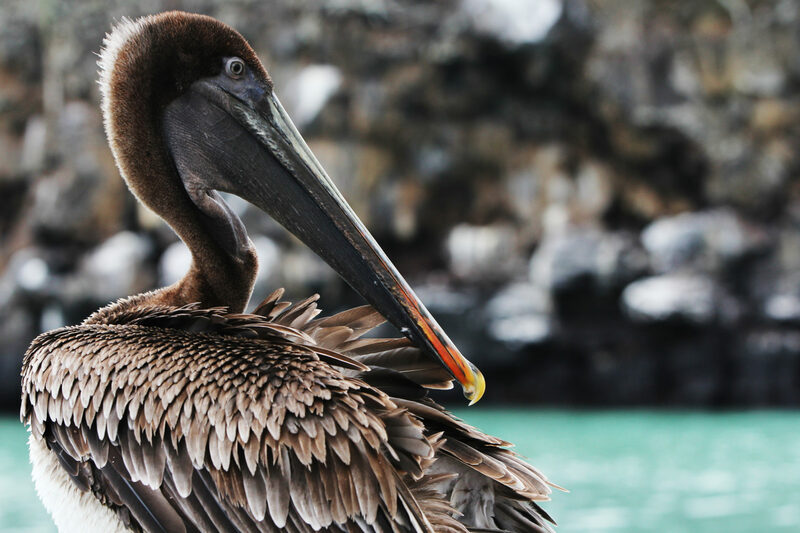 The ability to get up close and personal with local wildlife attracts thousands of tourists to the Galápagos Islands every year. 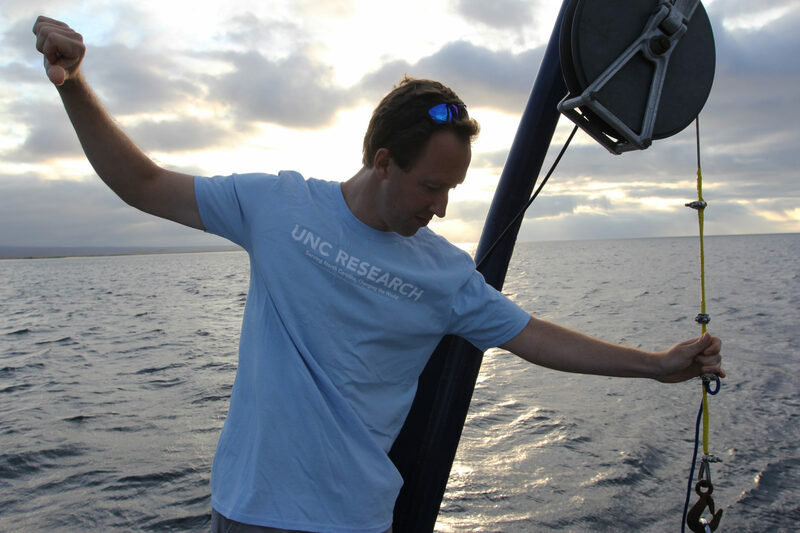 [/media-credit] Scott Gifford, a UNC oceanographer, signals to lower a Niskin bottle off the back of the Sierra Negra. 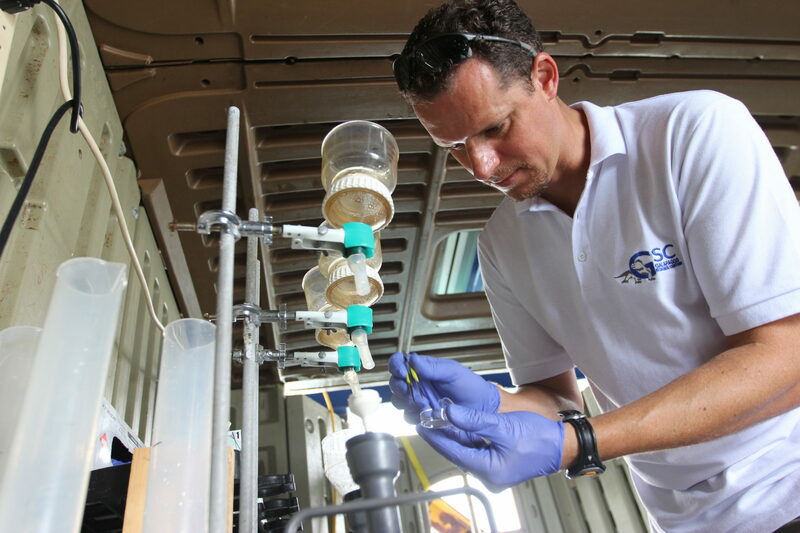 Gifford, along with his colleague Adrian Marchetti, spent three weeks in October 2015 aboard the research vessel, collecting water samples from various locations around the archipelago. The levels of microbial bacteria and phytoplankton found in the water helps them study the effect of El Niño around the globe. [/media-credit] A Galápagos land iguana rests in the sun on Plazas Island. 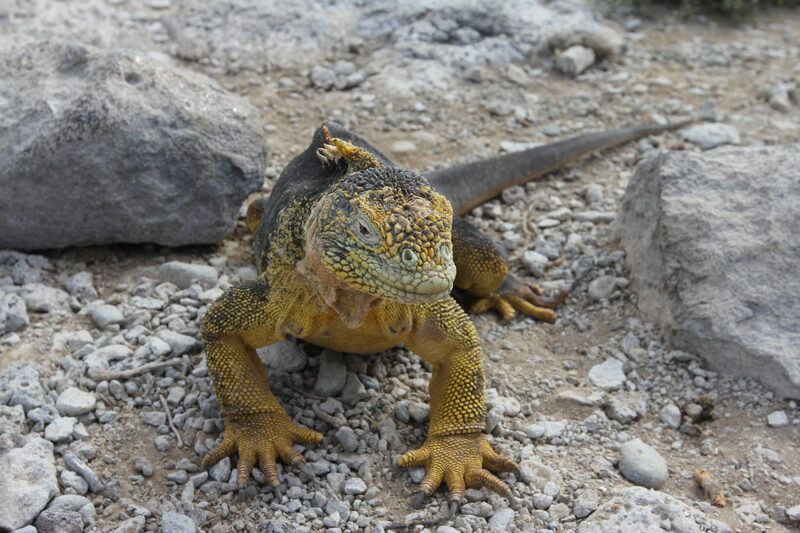 High levels of rainfall during El Niño years increase the island’s vegetation, which boosts the growth of land iguana populations. At the same time, though, marine iguanas struggle due to increasing water temperatures, which cause a decrease in phytoplankton production — a key food source within the ocean food chain. Live spiny lobsters sit for sale at the Santa Cruz Fish Market. Once overfished almost to the point of extinction, these prickly crustaceans have made a big comeback thanks to sustainable fishing practices instituted in 2009 (influenced in large part by the World Wildlife Fund). 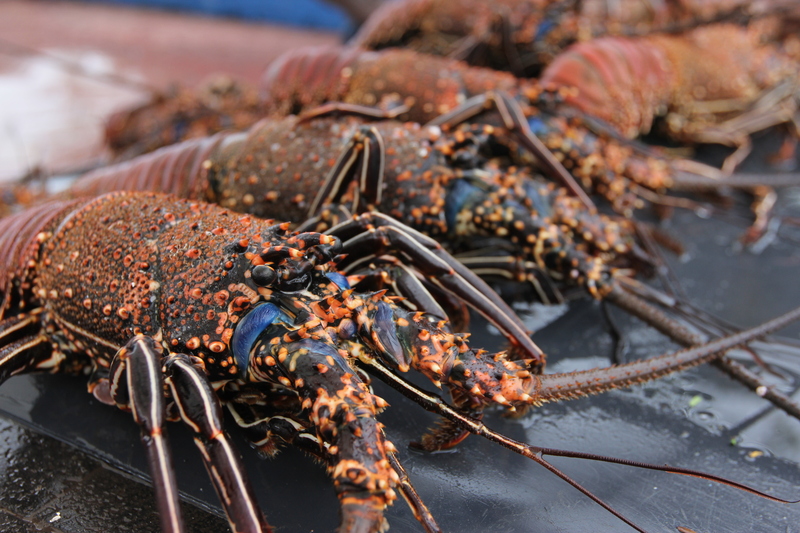 Lobster season in the islands typically begins in October and runs through January. 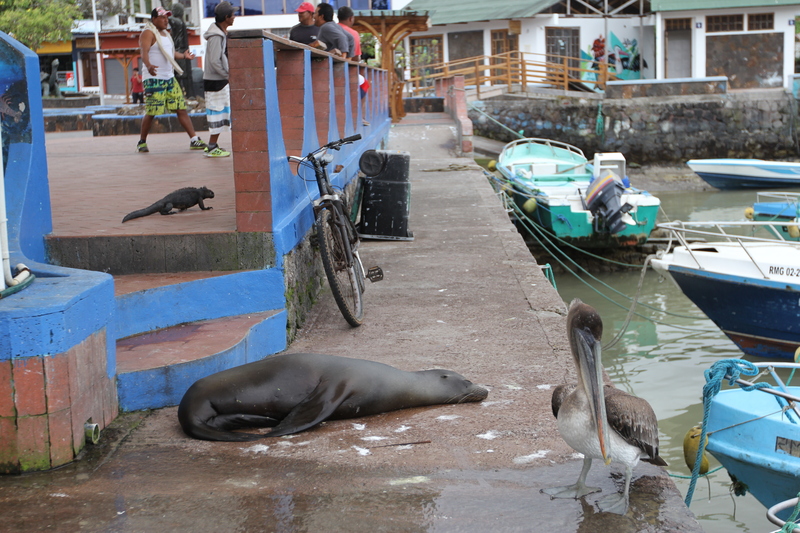 A blue pelican, a Galápagos sea lion, and a marine iguana create a strange sight at the Santa Cruz Fish Market. 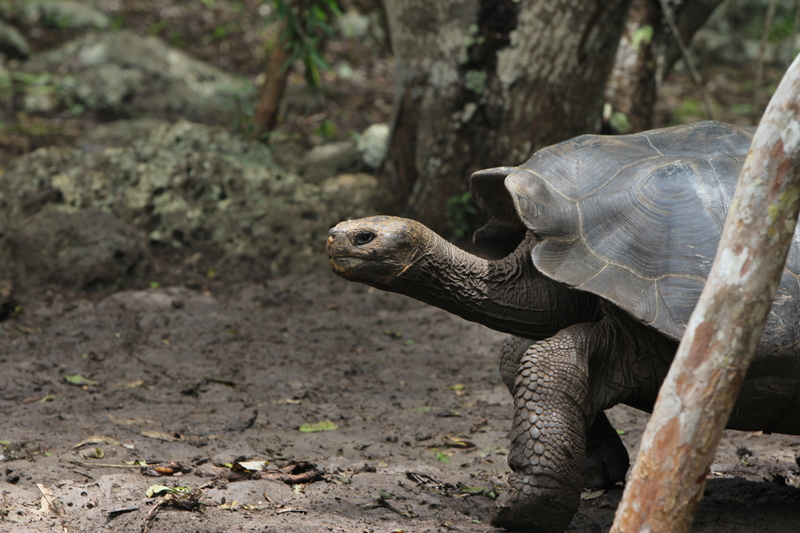 These animals face serious risks if ecotourism in the Galápagos continues to match its growth rate from the past two decades. 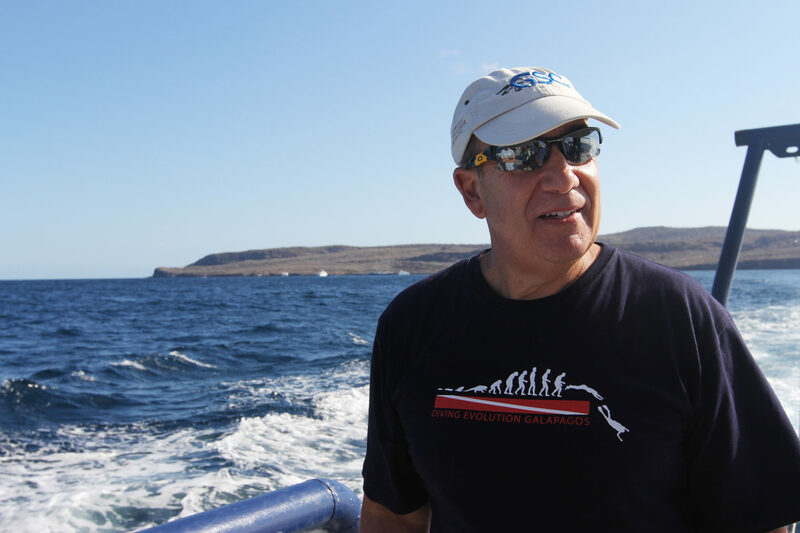 In 2016, the Ecuador government asked Steve Walsh, director of the UNC Center for Galápagos Studies, and Carlos Mena, Galápagos Science Center director, to generate scenarios that reflect the number of people the islands can accommodate before they start to lose their luster. 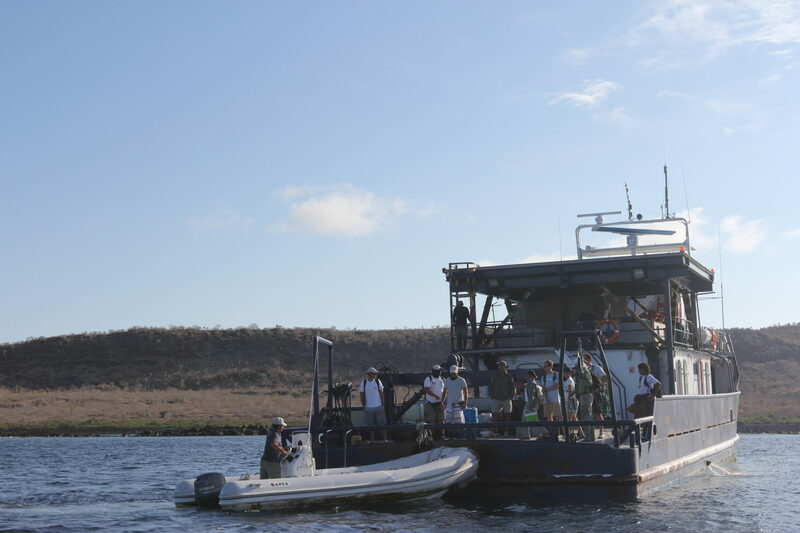 Researchers from UNC-Chapel Hill, the Galápagos Science Center, and the Galápagos National Park, gather at the back of the Sierra Negra, where a zodiac boat will transport them to the nearby undeveloped island of Santa Fe. 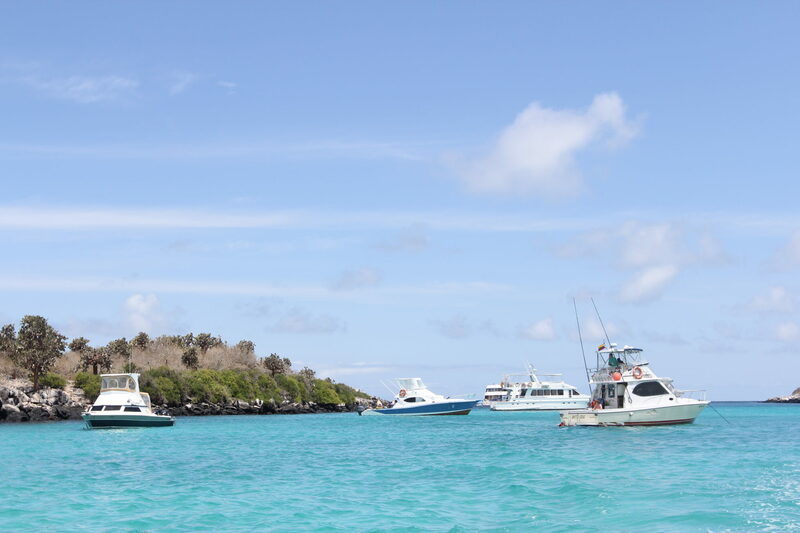 “How do tropical soils form?” Madelyn Percy, a PhD candidate in the Department of Geological Sciences, posed that question when asked to describe her research in the Galápagos. In the fall of 2015 and 2016, Percy spent five weeks collecting soil samples from the highlands of San Cristobal Island – home to the iconic Galápagos giant tortoise. 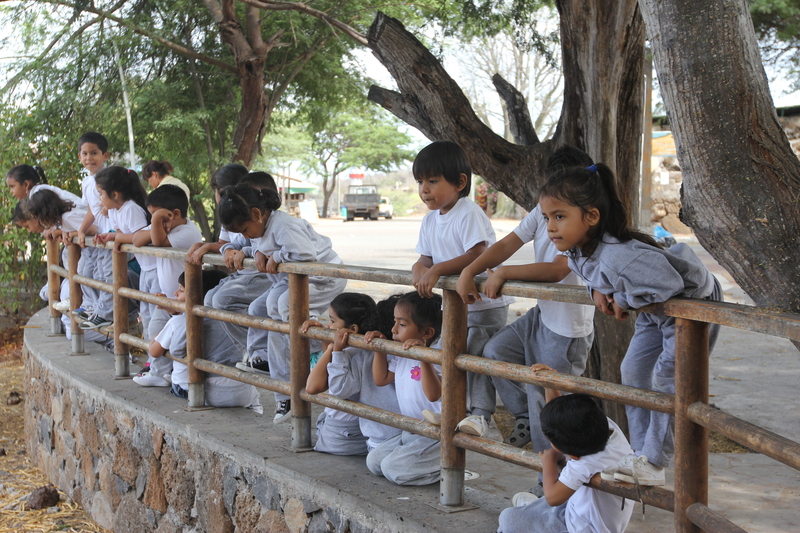 Students from Pedro Pablo Andrade, a small, private elementary school, look out over the main port on the island of San Cristobal. The town, Puerto Baquerizo Moreno, is the second-largest in the archipelago and home to approximately 9,000 residents.